← WTF is a Roux? Eggs Benedict for me. Chipped beef and fried eggs over toast points and a sausage roll for the hub. And just to note, typically I’m the queen of homemade everything, but the hollandaise sauce I make comes from a Knorr packet. Know why? 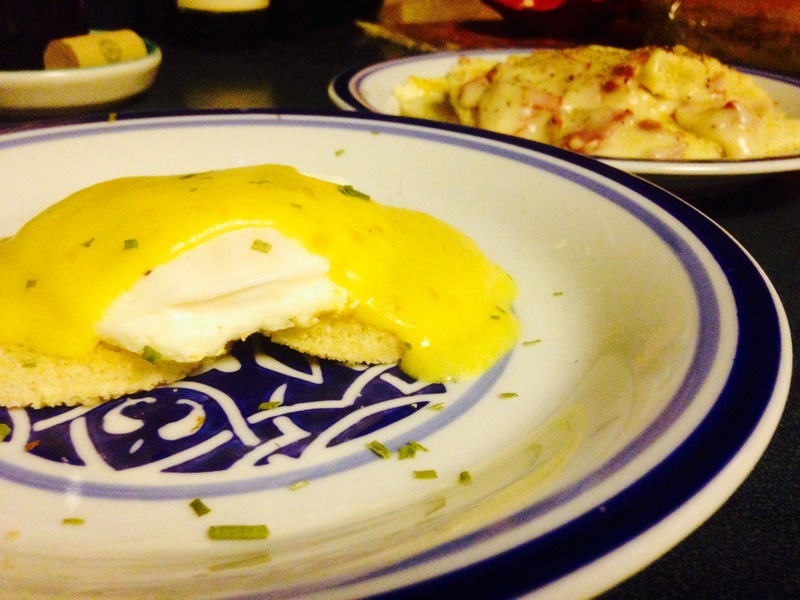 Because it’s $0.89 cents at the store and the effort to homemake hollandaise ain’t worth it. However, my lazy admission on the hollandaise having been made, I don’t skip out on the sausage roll. The end result is too damn good. Go get a little packet of yeast at the store, follow the instructions on the packet to make a loaf of bread dough. 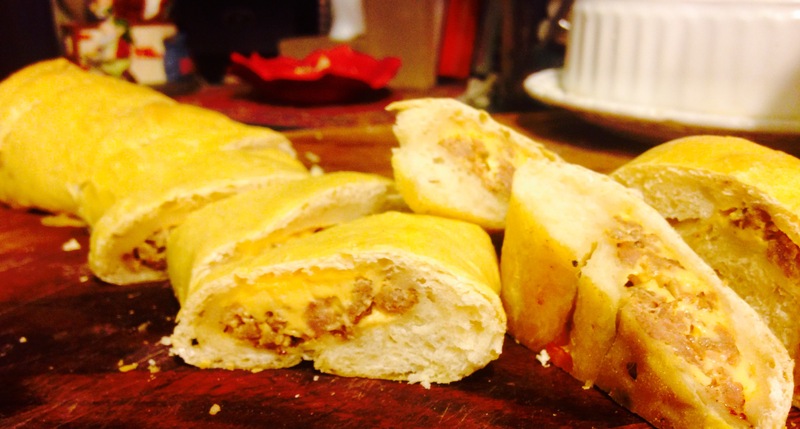 Once you’ve got the dough made up, fry up some of your favorite sausage. (I use regular Jimmy Dean sausage because I live in Virginia and I grew up on it.) Crumble it as you fry it. Then, roll out your dough length wise and using plain-old Kraft American sliced cheese, line the dough from end to end and then dump your fried sausage onto the center of the cheese, spreading from end to end evenly over the cheese. Now, there are 2 ways to do the next part. 1: You can roll the dough onto itself, so it ends up looking like one long, giant cinnamon roll. (So when you go to slice and serve it, it actually looks like little sausage cinnamon rolls.) OR… 2: You can do like I did in the picture and make it into one long giant hot pocket-looking thing. (I do it this way, because the stuffing stays intact better and I prefer the resulting ‘chew texture’. And if you choose this method be sure to bake it seam-side down. We don’t want any leaky cheese.) Bake at 350 until just slightly brown. A few minutes before you pull it out, brush it generously with egg and pop it back in for those last few minutes. Keep a close eye on it though, it’ll get brown too quickly if you don’t! Then, once it’s done, pull it out to rest/cool completely before slicing. This sausage roll, even though it’s kind of breakfast-y, also doubles as a badass game day appetizer that everyone is sure to crush! And if you’re planning to serve it as an appetizer feel free to pair it with some salsa or ranch dressing.